A Sampling of my boxed consoles! 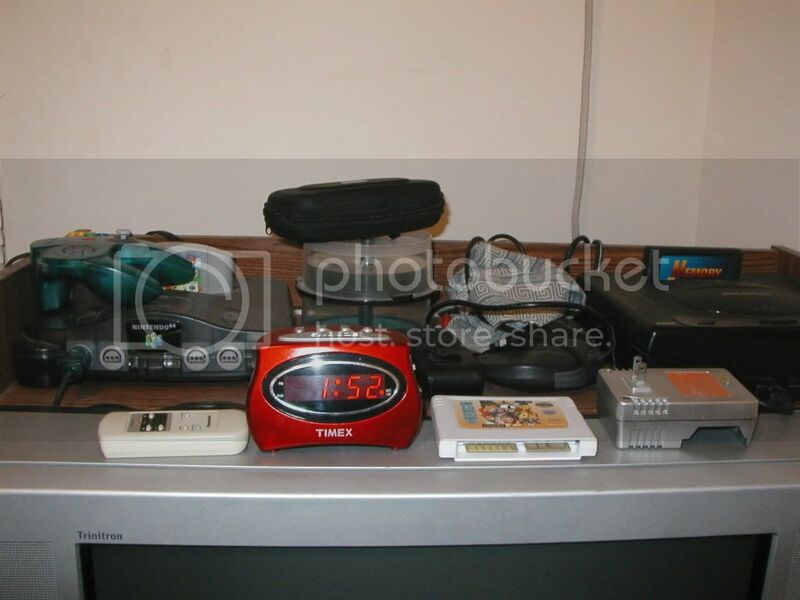 L - R Amiga CD32 , Mega CD II , Neo Geo CD , Goldstar 3DO , Virtual Boy , Jag 64 , PC Engine , Gamecube and Lynx! How is the CD32? I've been wanting it for a while but the only times I ever encounter it are those $100 buy it nows on eBay from that shady dude from Shanghai. Don't know if it's trustworthy or worth it. To put it bluntly the CD32 is an underrated machine. It was the first console I purchased since the 2600! I shared a house with a guy who was a "Sega Master" and was paid per call on their helpline - so I had no need to buy a SNES or Megadrive as I always seemed to be living with someone who did! A girlfriend introduced me to the CD32 and the moment I saw Microcosm running my jaw dropped. I always liked Amiga games but couldn't justify buying a full 1200 set up for gaming. The CD32 was the answer to that! There were some awesome point and click games (Simon the Sorcerer , Darkseed , Beneath a Steel Sky ), some decent Shmups - (Super Stardust , Chaos Engine , Alien Breed) , and sims such as Gunship 2000. So yeah its worth it - there is a distincly european art look to the games which seem to have a character all of their own even if you've seen it all before. As for purchasing one - well according to the forums beware of the Chinese ones - They are either illegal copies or the remains of the Phillipines stockpile - either way you are better off paying a premium for one privately.I got stung though after purchasing one in "fair condition" that had some serious corrosion issues and a controller with dodgy connections (common but fiddly to fix - you'll need a soldering iron). They do tend to be reliable but because the major releases were in the UK , Germany , Australia etc be aware that most have 230-240V power supplies and are PAL out of the box.This can be changed to NTSC with an Amiga mouse in the start up BIOS. As for the software - it is difficult at times to find and overpriced - you are much better waiting for Joblot sells on evilbay or via the guys on the Forums - I am happy to help out too! My boxed one is a rarely used UK model - I continue to use the dodgy one with a new controller - I never complained to ebay though because it was a good price and it came with some decent software. CD32 software is tough to track down! I'm still looking for a decent source. I'd like to find out whatever became of 'Centsible Software' They used to have a decent selection of all amiga goods. Bought out? Merged? Closed shop? If the shady CD32s being sold from Chinese sellers are leftovers from the Philippines stock... that wouldn't necessarily be bad. All their BIY claim it's an NTSC console. It'd be easier getting that to run than a PAL console... I think. Well I don't have any extra cash at the moment anyway, but I'll be cruising ebay once in a while to see if any legit CD32s are up. 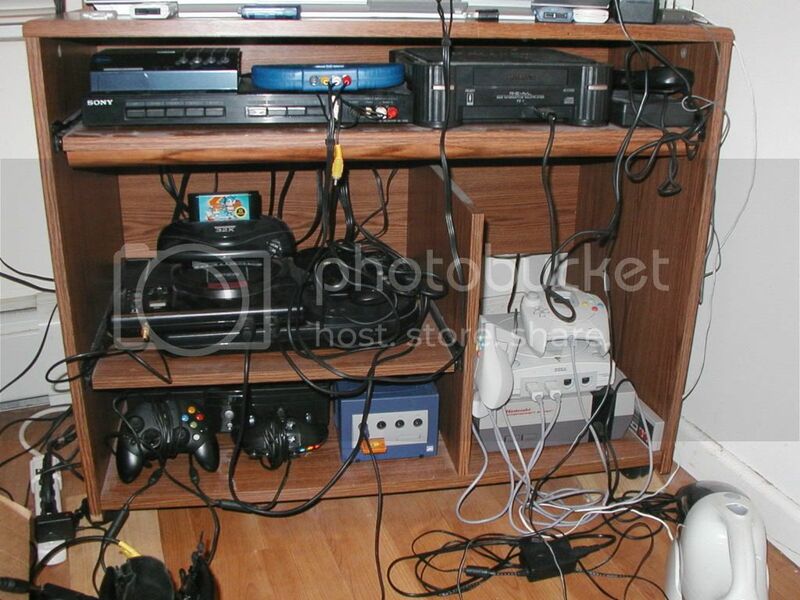 Here are the consoles currently connected to my TV (just about all of 'em). Its nice to have everything hooked up ready to play! thats a giant cord jungle mess! If my dog got anywhere near that, I think he might accidentally strangle himself. I will post photos of my setup after easter. My gf is loving enough to let me have 10 consoles hooked up to the television in our living room. Wire management has never been my specialty. My Jaguar isn't hooked up and neither is my PS1. I'm not even sure if the Jag is still working. I plugged it in a few months back and it decided to smell like burning chips. Shoved it in the closet haven't touched it since. My 360 is hooked up to my PC monitor so it's not there. All those consoles are hooked up via A/V but I have to do some minor unplugging/replugging for the AC especially with that ginormous Genesis/32x/CD combo. I want a 32X too. I got bored. Time for some "somebody buy Bry a camera" pictures. First up is my DS games. Here is some of the smb3 e-reader cards. These are level cards that unlock some different levels to play. 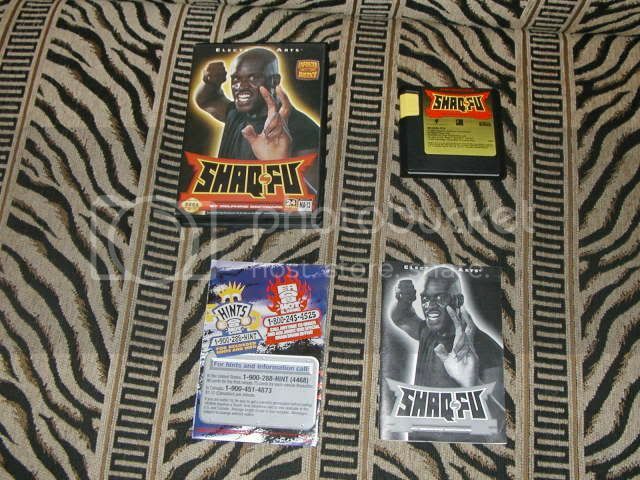 These cards show a demo of how to do a special trick. These cards give you items in your item storage. These cards act like switches turning a special feature on or off. One of them makes enemies turn into coins when you use a fire attack on them. The other one is quite interesting. It makes vegetables appear like in smb2(us) and you can pick them up and throw them at enemies. strange. Now time for some gamecube games. and last of the batch of crummy pictures. Someone buy me a camera! 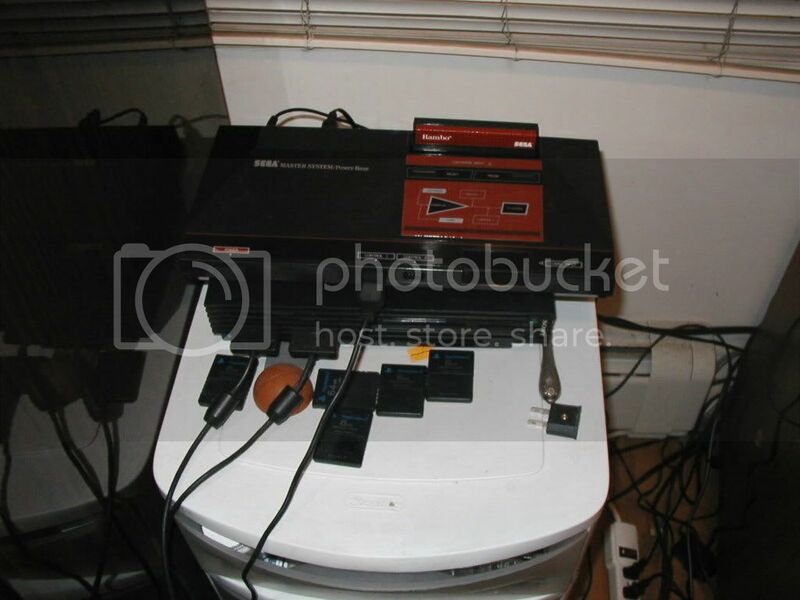 Jap Sega Megadrive modded with 50/60hz switch and language/region mod switch. Xbox 360 Pro got the new Jasper chipset release! Still prefer my PC though. Creative 3DO Blaster - ok this is not technically a console but i dug up my old Olivetti 486 PC from the loft earlier today to check if i still had it all for someone in this forum! I may have missed a couple of systems out but will not now until i clear out the loft and cupboards etc... and of course i have so many games for all these systems!! I also have a few PC systems which include my current Core 2 Quad gaming rig, my Dell work PC and a few oldies stored away in the loft! Last edited by grand_barbare on Mon Apr 12, 2010 2:27 pm, edited 6 times in total. I had watched your image its look like that you have great video games collection.. 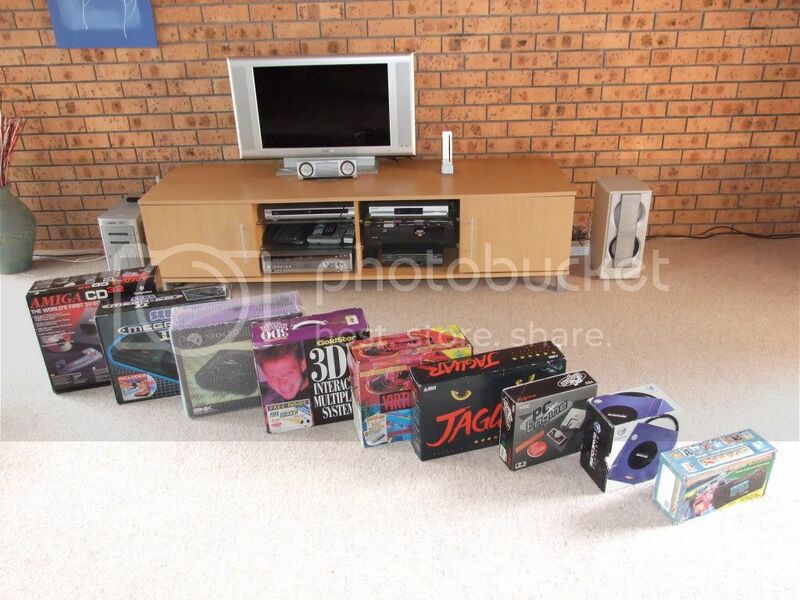 I especially like Neo Geo CD , Goldstar 3DO , Virtual Boy.. This is my updated pic of my current boxed consoles! 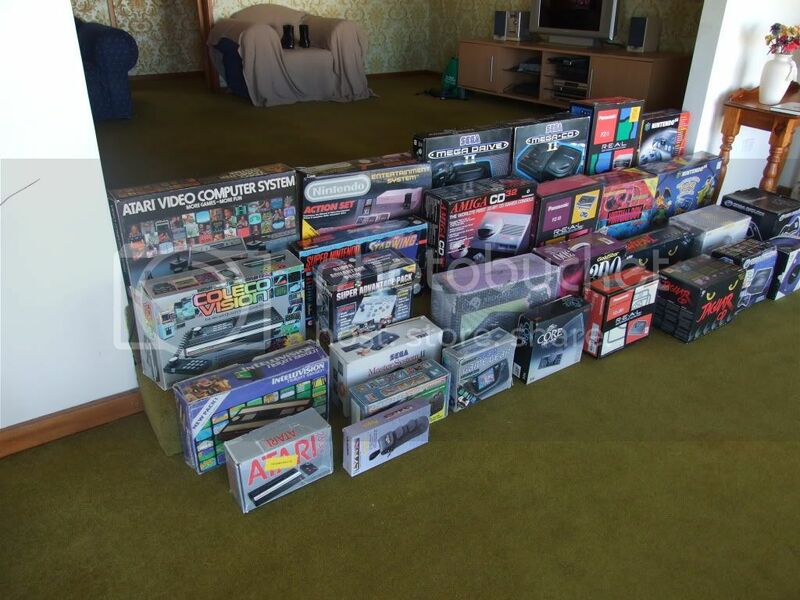 pictured are some of the larger boxed accessories as well - enjoy! 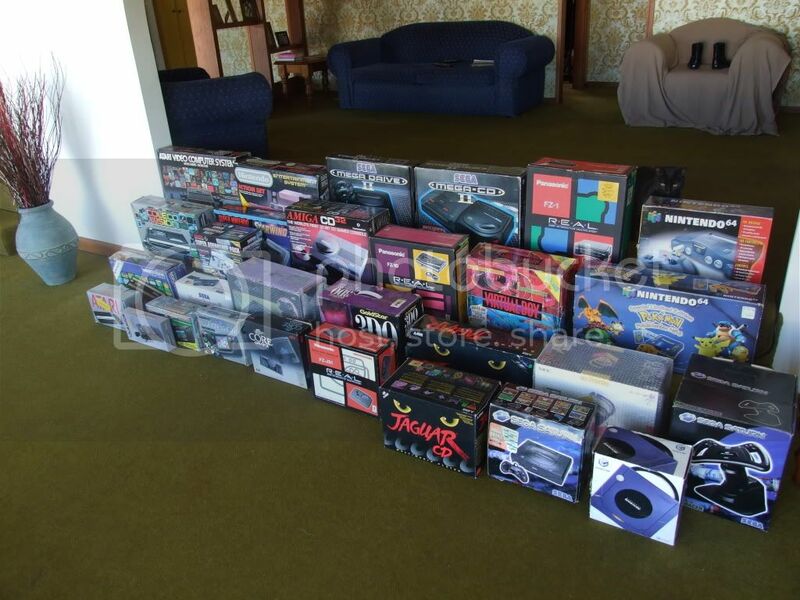 left to right - Atari 2600 , Colecovision , Intellivision , Atari 2600jr , NES , SNES , Killer Instinct controller pack , Master System II , Lynx II , Lynx II carry bag , Mega Drive II , Amiga CD32 , Neo Geo CD , Game Gear , Core Grafx Turbo , Mega CD II , FZ-10 , Goldstar 3DO ,Pana joystick , FZ-1 , Virtual Boy , Jaguar , Jaguar CD , N64 , N64 Pokemon edition , PC-FX , Saturn , Saturn wheel and Gamecube. this does not include my loose stuff which includes a Wii , CD-i , Sanyo 3do , Platstation 1 , DS ,DS lite , Gameboy , Vectrex , Dreamcast plus others! tell that ghost to stop standing on your chair. heh. Good to see your boxes are in good shape. I had a little disaster happen in one of my rooms and a few boxes that had nothing but boxes in them got wet. I had to toss out so many moldy boxes I wanted to cry. Almost every 3DO long box was ruined and a good chunk of console boxes. Luckily my Nintendo cart boxes were up high enough to survive unharmed. a guy on atariage (breakpack) i think. Welcome to the club Alex, it seems that you really do enjoy the 3DO as much as we do! Matty, damn fine collection you got there, everyone really. I should take pics of mine sometime soon. Last edited by grand_barbare on Sun Feb 06, 2011 9:47 am, edited 12 times in total. Can you tell me about the MVS Muticarts?